Jesus, Mary and ….Terry Christian the stand-up? Terry Christian isn’t the first person I would think of when it comes to being a natural stand-up comic. The Manchester-born broadcaster and presenter is more famed for his ‘motor mouth’ reputation as the former presenter of cult Channel Four youth show, The Word and for almost pipping Ulrika Jonsson to the title of Celebrity Big Brother winner 2009. 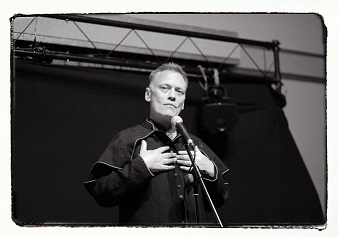 So, to see him perform his own stand-up show (written and performed by himself) it is too easy to expect the Terry Christian audiences know from the screen – gobby, opinionated and bloody irritating (to some). However, Naked Confessions of a Recovering Catholic is not only very funny, brilliantly observational and an overdue pop at the absurdities of the Roman Catholic Church, Christian himself is a natural and fantastically self-deprecating stand-up. “I don’t believe it! @terrychristian is actually FUNNY!! Brill show”. Excuse my shock but you see, I was a little bit sceptical about Terry Christian pulling off a stand-up show (complete with a totally no-holds-barred question and answer session afterwards). Most comedians start young and do the rounds for years. But, as Christian entered from the back of the hall dressed as a priest (!) complete with floor-length cassock and blessing the audience with ‘Holy’ water it was impossible to not burst into laughter. So, you have got to hand it to him for having the balls to then put himself through what is a very honest, personal and at points painfully funny ‘confession’ of his life growing up in a big Irish Catholic family in Old Trafford, attending the posh ’11-plus’ era top local Catholic school (St Bede’s), through to the misery and hilarity of the famous Catholic guilt complex and how it carries itself into adulthood in all its clumsy and awkward incarnations. As someone who is also from a massive Irish-Mancunian Catholic family, there was so much I could relate to and Christian’s very cheeky and spikey pops at the Catholic Church would make my Irish mammy blush (but chuckle too) and for anyone who has ever know a nasty nun or pompous priest, there are lots of laughs to be had. I grew up watching my parents howl with laughter at the Irish comedian Dave Allen and parts of Christian’s set echo some of Allen’s philosophy that it is healthy to laugh not just at yourself but of course, at the Church and those in power. Humour is a great leveller and comedy can break through barriers if delivered well. Terry Christian has found a natural home on the stage – a welcome reinvention for him and a great evening of laughs for those in the audience. Terry appeared at Stockport Masonic Guildhall, Sat 29th June 2013.